It will take three to four years to complete construction of the factory. 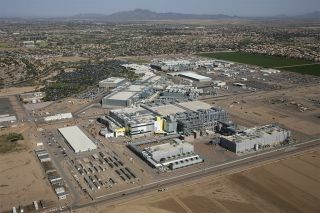 The site will employ more than 3,000 high-tech, high-wage jobs for process engineers, equipment technicians, and support technicians, and 10,000 total long-term jobs in Arizona. "Intel is a global manufacturing and technology company, yet we think of ourselves as a leading American innovation enterprise," Intel CEO Brian Krzanich said. "America has a unique combination of talent, a vibrant business environment, and access to global markets, which has enabled U.S. companies like Intel to foster economic growth and innovation. Our factories support jobs—high-wage, high-tech manufacturing jobs that are the economic engines of the states where they are located." Krzanich announced the $7 billion alongside U.S. President Donald Trump at the White House today. The accompanying press release puts added focus on American job creation, though looking beyond the politics of the announcement, the interesting thing here is setting up shop for 7nm semiconductors. We're still waiting on Intel to make the transition to 10nm, which will come with Cannonlake. It hasn't been easy for Intel to get there. After pushing back the anticipated launch of Cannonlake to late 2017 or early 2018, Intel introduced a third generation of 14nm processors (Kaby Lake) to fill the gap, and there's word of yet another 14nm part, Coffee Lake, as well. After the 10nm Cannonlake, the 'Process' part of Intel's three stage Process-Architecture-Optimization strategy, we'll have Icelake (Architecture) and Tigerlake (Optimization). 7nm is far enough out that Intel hasn't even revealed the codenames for the parts yet, so don't get too excited. The eventual 7nm transition will also lead to more sophisticated data centers and advances in artificial intelligence technology. Intel has plans extending well beyond 7nm, often peering 10 or more years into the future. Carbon nanotubes, graphene, and other advances may take over when silicon reaches its limit. Moore's Law (which was more of an observation and a goal to strive toward, but that's beside the point) is on life support, but it will remain with us for at least a little while longer. And even when it's dead and buried, people will still exhume the grave to recall the heady days of exponential growth in transistor counts, wondering whether or not the latest tech can run Crysis.